Location: Forms the principle entrance to the castle, from the W. The retaining wall links the S pavilion with the main castle building. History: Powis Castle was established as a Welsh stronghold, probably of Owain Cyfeiliog and his heirs, from c1170, and parts of the surviving structure are thought to date from the late C12-early C13. The castle was sacked c1275, and in 1286, Owain ap Gruffydd ap Gwenwynwyn paid homage to Edward I: a substantial programme of rebuilding followed - the layout, and much of the structure of the present buildings were determined in this work of c1300. After the castle was acquired by the Herbert family in 1587, it was gradually remodelled as a country house: the main entrance was established in the E gate-tower (itself an addition of the C15), and the main entrance of the medieval strong-hold became the back entrance of the Elizabethan house. The gate-way was destroyed when the castle was besieged in 1644, and in 1668, the present gate- house was built on the site of the earlier structure. The NW pavilion was extended, and the W elevations remodelled again - perhaps by Smirke in the early C19 - at a time when the gatehouse had been re-instated as the main entrance to the castle. Description: Dated over the inner face of the arch, 1668. Brick with stone dressings including balustraded parapet to S and E elevations, and stone facing to W wall - probably the result of early C19 remodelling. 2 single storeyed pavilion blocks are linked by an arched entrance. The shield of arms over the gateway is early C19. W elevations have 4-centred arched doors (double doors in N pavilion), with similar loft entrances above. Elevation facing garden in S pavilion has 3x3-light stone mullioned and transomed windows which appear to be original features, and squared balustrading to parapet. Facing the courtyard, the pavilions had open arcaded fronts which were later infilled, and mullioned windows inserted in each bay. The buildings were intended to house coach house and stables, and the original stable fittings survive in the S pavilion - a series of arcaded stalls. The retaining wall to the courtyard defines the S boundary of what had originally been the outer bailey of the medieval castle. The rubble retaining wall with squared balustraded parapet is probably also late C17: it is shown in Thomas Dineley's drawing of the courtyard, dated 1684, and the detail of the balustrading connect it with the pavilion, as well as with the C17 entrance and stairs to the castle, dated to c1670. Dineley's drawing shows that the present raised bed was originally a raised walkway. 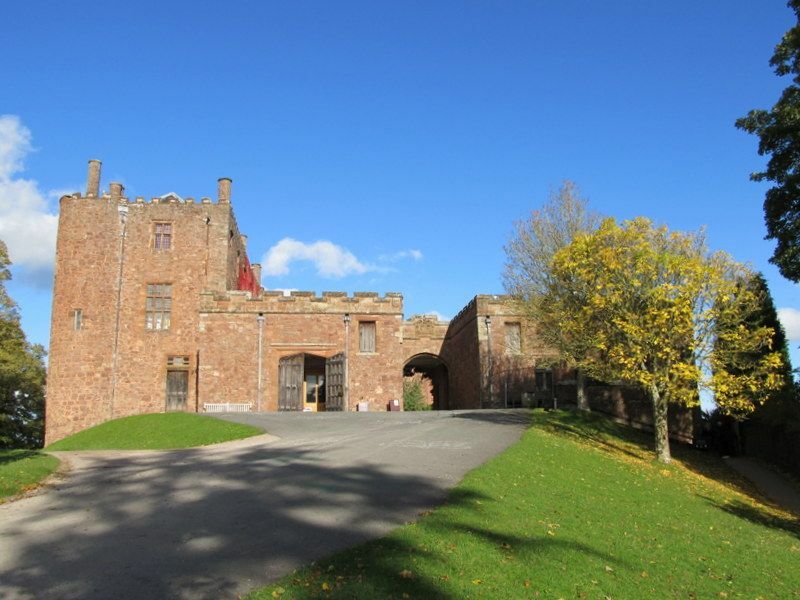 The entrance pavilions and retaining wall are important components of the late C17 work at Powis Castle, and especially as they were clearly an integral part of a larger scheme, including both entrances to the castle, and the terraced gardens. Forms the N boundary of the courtyard to the W of the main castle building.